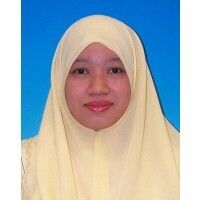 Dr. Azura binti Amid, a graduate of the University of Malaya, Kuala Lumpur started her career as a teacher at Segamat, Johor in 1996. She was appointed as an assistant lecturer at the International Islamic University Malaysia in 2001 and later as a lecturer at Kulliyyah of Engineering (IIUM) in 2011. She obtained the Bachelor of Science with Education (Biology), Master of Science (Molecular Biology in Plant) and Degree of Doctor of Philosophy in Molecular Biology from the University of London. Currently, she is attached as Associate Professor at the Department of Biotechnology Engineering, a ... show more nd Dean of Kulliyyah of Engineering, IIUM. 2009 - 2012 Production of L-cysteine from Various Parts of Garlic Plant"
2006 - 2009 Molecular Cloning, Sequencing, Purification And Characterization Of Stem Bromelain From Ananas Comosus. 13 February 2018 Certificate of Reviewing. International Journal of Biological Macromolecules - International level. 12 December 2017 Emerging Innovation Awards. Ministry of Science, Technology and Innovation (MOSTI) - National level. 22 February 2017 OTHERS. Panel Penilai Dana Kem Pengajian Tinggi - National level. 19 September 2016 KPT grant assessor. Ministry of Higher Education - National level. 02 September 2016 Outstanding Researcher Award (University). International Islamic University Malaysia - University level. 02 September 2016 University Innovation Award. Others - University level. 17 March 2016 IPT Evaluation panel for MoE grants. Universiti Malaysia Kelantan (UMK) - National level. 01 November 2015 6. Certificate of Reviewing for Journal of Ethnopharmacology. ELSEVIER - International level. 29 September 2015 Gold MEDAL. IRIE 2015 - University level. 18 September 2015 2nd Prize for Halal and Nutritious Food Competition. IRIE 2015 - University level. 02 April 2015 Certificate of Recognition on Halal Innovative Product. Ministry of International Trade and Industry - National level. 01 January 2015 Certificate of Outstanding Contribution in Reviewing for Journal of Ethnopharmacology. ELSEVIER - International level. 07 November 2014 Gold Medal. Ministry of Agriculture Malaysia - National level. 07 November 2014 MAgIC of the Year Award. Ministry of Agriculture Malaysia - National level. 02 April 2014 MArquis Who'sWho in the WOrld 2015. MArquis Who'sWho Publications - International level. 10 May 2013 Malaysian Innovative Product Awards 2013. ITEX 2013 - International level. 16 April 2013 Facilitator for FRGS workshop. IIUM - University level. 07 March 2013 University Reviewer for ERGS. IIUM - University level. 20 February 2013 2nd Prize for Commercial Potential Award. Research Management Centre - University level. 20 February 2013 Gold Medal IIUM Research, Invention and Innovation Exhibition 2013. IIUM - University level. 31 January 2013 University Reviewer for FGRS. IIUM - University level. 22 February 2012 2nd Prize for Commercial Potential Award. University - University level. 22 February 2012 Gold Medal. IRIE, IIUM - University level. 01 February 2011 3rd Prize Commercial Potential Awards. Research Management Centre, IIUM - University level. 01 February 2011 Consolation Prize. Research Management Centre, IIUM - University level. 01 February 2011 GOld Medal IRIIE 2011. IIUM - University level. 01 February 2011 SIlver Medal IRIIE 2011. IIUM - University level. 02 November 2009 Quality Award. International Islamic University Malaysia - University level.